Why Do Business Owners Love to Buy Trucks? You may have noticed that some business owners like to buy a new truck or heavy SUV each year to save on their taxes. Have you found yourself wondering how spending money on a truck really saves money? What are the elements that come into play? Depreciation – All vehicles can be depreciated over 5 years. Bonus Depreciation – New vehicles qualify to take extra depreciation in their first year. Section 179 deduction – All vehicles can expense a portion of their cost outright. The limit for vehicles that weigh less than 6000 lbs is $3,160. The limit for vehicles that weight more than 6000 lbs is $25,000. Business use – These deductions work to some degree for vehicles that are used 50% or more in your business. The examples used in this discussion are for vehicles used 100% for business. All put together, the biggest tax deductions come from buying new vehicles that weigh more than 6000 lbs, due to the combination of bonus depreciation and the Section 179 deduction. But used vehicles that weigh more than 6000 lbs make a good showing on your tax return, too. Due to limits on deductions for new and used vehicles that weigh less than 6,000 lbs, lighter vehicles make for a less attractive tax deduction. Dennis might be understandably biased toward brands that are for sale at Laird Noller, but if you're local to Lawrence, Kansas and you’d like for him to show you any of these models, please contact him at: dbishop@lairdnoller.com. 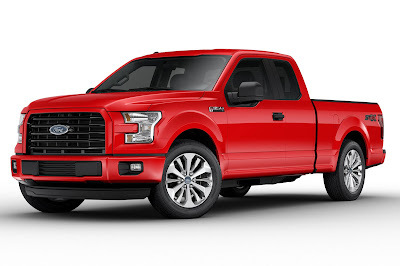 The Ford F-150 needs to be optioned correctly to weigh more than 6,000 lbs. Photo courtesy of Ford Motor Company (2017 model). Here are some examples of how much tax savings you could see. Each example shows a self-employed business owner who reports all income on Schedule C and has no children and no other deductions. The vehicle costs $35,000 in each example. Tax rates will be different for C-Corps and S-Corps, as well as for families with children. Each tax return is different – so treat these examples as illustrative estimates. * At the $40,000 income level, the taxpayer potentially qualifies for the Earned Income Tax Credit after taking this deduction - EITC is not factored in to this table as it varies considerably by family size. From the table, we see that if a single self-employed person who makes $100,000 in profit purchases a new truck on the very last day of the year they will save $11,300 in taxes – or 32% of the vehicle cost! Those are some big tax savings! The beauty of purchasing a truck for tax savings is that debt-financed vehicles qualify for this great tax deduction – in other words, the taxpayer qualifies for this deduction before they’ve even paid for the truck. Depending on your situation, buying trucks every year is probably not the most efficient way to save on taxes or manage your business budget! Please talk to your CPA about tax planning strategies for your specific situation.